This lesson summaries page is open to the public. The Team's lesson plans themselves are open to our amazing Supporting Members who make this site and lesson set possible. The lessons in this set were written by four of Rotation.org's most experienced lesson writers: Anne Camp, Neil MacQueen, Luanne Payne, and Cathy Walz. The Team set a high bar of creativity for each lesson. It also stepped up to the important challenge of how to teach children the lengthy and sometimes violent story of the crucifixion in a way that is developmentally and theologically appropriate. Read the Bible Background for more insights. One of the Team's many creative goals was to come up with unique ways for children to read this long story and discuss it without getting bogged down. Having chosen Mark 15:1-47 for our main text, and having two memory verses essential to our understanding the cross (Romans 5:8 and 1 John 4:9-11), we have provided each lesson with a creative approach to the scripture reading. These techniques also demonstrate how you might approach other lengthy scripture readings. To help with the length of the story, the Team has also created a condensed version of Mark 15's forty-seven verses that reduces Mark's word count by 40% without eliminating key verses or dialog. Supporting Members can see this condensed version here. Versions of it are linked in the Bible Games, Art, and Seder Workshop lesson plans. Otherwise, you are welcome to use the full version found in your Bibles. There are two lesson plans of special note in this creative set, the Cross Seder "Cooking" Workshop and the "Stations Reflection" Workshop. Patterned after a children's Passover Seder, the Cross Seder and its special foods provide students (and even intergenerational groups) with an enjoyable and tasty worship-inspired approach to the story. The "Stations" lesson plan provides three unique reflection activities for students already familiar with the story. It can also be used as an intergeneration lesson (as could many of the lessons in this set). With this set, the Team begins a new practice of writing lessons that fit into a "40- minute" class time, rather than the previous 50-minute guideline. As usual, suggestions are included for those with more or less time, and those with non-readers. The Bible Background and Lesson Objectives for the set offer a kid-friendly explanation of the meaning of the cross based on Romans 5:8 and 1 John 4:9-11. These key and kid-friendly memory verses from Paul and John explain that the cross "demonstrated" (showed, revealed) the love of God. Given the importance, length, and complexity of the Cross story, we recommend that traditional Sunday Schools use at least two of these lessons on successive Sundays. Rotation Sunday Schools will typically teach three to five of these lesson plans in a row. Five of the six lesson plans fully teach the story. The "Stations" Workshop lesson plan assumes students have previously used one of the other lessons in the set. Students creatively read through Mark's story using "Cross Story Boxes," then play a memory game with them before engaging in an aluminum tin embossing ("repoussé") art project to that reflects on the meaning of the story. The embossing project creates a serving dish intended to become part of the student's Easter family dinner celebration. An option to turn it into a "reflective" wall hanging is included. Students receive a deck of "Mark 15 Story Cards" created specifically for this lesson. The cards have story images and questions to aid the Bible study. Students then play a modified version of "pictionary" (based on the cards) to reinforce their memory and knowledge of the story. 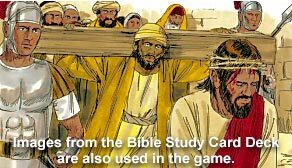 Students will study the story of the Cross using lessons found in the "The Life of Christ" software, then play a memory verse game in "Cal & Marty's Scripture Memory Game software." This lesson spends extra time learning the two designated memory verses for this set: Romans 5:8 and 1 John 4:9-11—both of which explain the meaning of the cross and its life application in kid-friendly language. This lesson was written for both a multiple computer "lab" setting, and a "presentation" setting (one computer connected to a larger monitor). 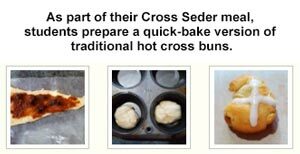 Students will first prepare hot cross buns then participate in a scripted "Cross Seder" meal that's based on a children's Passover Seder --but uses Mark 15 as its story (instead of the Exodus story which a traditional Seder would use). Students will participate in three "learning stations" that take them through the story of the Cross with a special focus on the meaning of the Cross for us today. A fun science experiment (demonstration) about the sin Jesus sacrificed himself to forgive. A music video reflection activity featuring a "mashup" of an awesome contemporary Christian song with moving scenes from a film about Jesus. A special heart-cross creation activity. 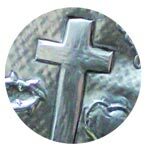 This workshop's lesson plan assumes the children have already learned the story of the cross. Students view and discuss the trial and crucifixion scenes from an age-appropriate** film about Jesus. They will then view a short 4-minute film about two boys in worship that will help each student reflect on their own personal response to Jesus' sacrifice. Both films are available for free on YouTube and can be also downloaded (instructions included). 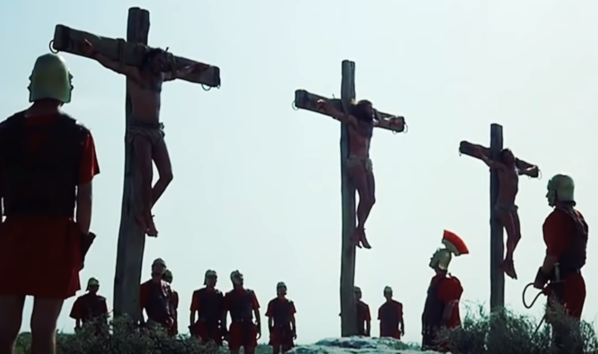 **Many good films about Jesus are too graphic for young children when it comes to depicting his trial and crucifixion. We reviewed over two dozen live actor and animated films to make our choice. This lesson includes notes about the films we did not select, and why. The lesson also offers some alternate choices. Team Writers: Anne Camp, Neil MacQueen, Luanne Payne, and Cathy Walz. Lesson Contributors: Jaymie Derden, Carol Hulbert, and Amy Crane. Commenting and improving on the lessons: You!